Have you ever been at the mall and are doing your best to get in and out as quickly as possible (crowds and malls are not my favorite) and then you walk by an auntie ann’s and almost die from excitement (or the delicious aroma)? Just me? Cool. Well I’m so excited to share this recipe with you today!! In the past year or so I have become a huge fan of soft baked pretzels. And especially now that Baby H is on her way, I am always wanting carbs. :) Although, let’s be honest, I was already that way before! I’m so excited to share with you how to make pretzels from scratch at home and with your own honey mustard dipping sauce (so good!) to serve with it. I love my mall pretzels, but these are SO much better. Seriously, once you try a homemade pretzel you will scoff when you see the pretzel stand at the mall, and keep on walking by. I am doing you a favor! Ok, let’s talk about this honey mustard dipping sauce. I want to use this on everything. It is made with Maille Dijon Originale mustard and is simply divine! I have been a huge fan of their mustard for awhile and was so excited to be able to work with them. These everything pretzels with honey mustard dip will be a hit at your next holiday party or even as an appetizer for Thanksgiving. Everyone will be so impressed you made pretzels from scratch, and you get to avoid the mall crowds and eat your pretzels in peace. Pretzels may seem intimidating to make but they actually are pretty straightforward once you get the hang of it. I have some tutorials on my instagram page in my stories if you want a step by step on how to shape them! To make the honey mustard dipping sauce: Whisk together dijon mustard, mayonnaise, honey, and lemon juice. Cover and refrigerate until ready to serve. To make the pretzels: In the bowl of a stand mixer fitted with dough attachment, Combine warm water, brown sugar, and salt. Sprinkle yeast on top, and let sit for 5 - 10 minutes or until foamy. Turn mixer on to low speed and add in the flour and melted butter. Stir on low until combined, and then increase speed to medium/medium-high for 4 - 5 minutes until dough pulls together into a ball and is smooth. Dump dough out and shape into a ball. Lightly oil a large bowl and place dough inside. Cover with a kitchen towel or plastic wrap and sit on counter for 50 min - 1 hour or until doubled in size. Dump dough out onto a clean surface. Divide into 8 equal portions. Using your hands, roll a portion of the dough into a 20 inch rope. Form a “U”-shape with the dough rope. Bring the ends towards the middle and twist. Lightly press ends into the bottom, to form a pretzel. 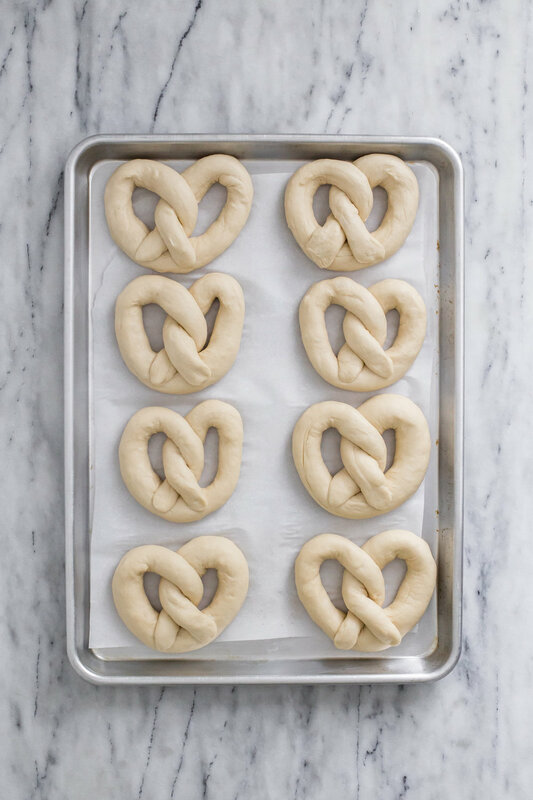 Set pretzel on a large baking sheet lined with parchment paper and repeat with remaining dough. Bring a large pot of water to a boil. Sprinkle in the baking soda. Drop the pretzels into the boiling water, two at a time, for 30 seconds, making sure to dunk pretzels in the water a couple of times. Set aside on the second baking sheet lined with parchment paper. Repeat with remaining pretzels. Brush the egg wash on top of each pretzel. Sprinkle generously with everything bagel seasoning (or course salt if not using). Bake in the preheated oven for 12 - 14 minutes or until tops are golden brown. Serve with honey mustard dipping sauce! These taste best the day off. You can also reheat them slightly by popping them in the microwave for 15 seconds. This post is sponsored by Maille. All opinions are my own.